How do you source your music? Music libraries that provide music that is copyright free and in the public domain. Some tracks are licensed under an attribution license and these are provided on our credits page. The artist direct - We have been given specific permission by an artist to broadcast a track. Can you stream commercial music? No we cannot stream commercial music because of copyright laws and radio licensing. In order to play your music, first it has to fit the theme our of station. It should therefore either be ambient, electronic, electro, maybe dance or space orientated in some way. You must hold all the rights to your music or your music must be licensed under Creative Commons licence (http://www.creativecommons.org) or other free content licence.. You cannot have a conflicting legal obligation, such as having previously joined one of the many royalty collection societies around the world. Please note that you if you include samples or music from anywhere else you must have the necessary rights to use it. We require you to confirm this via a legal form. Please contact us for further details and to get your music heard by our many listeners. How can I get involved in Radio Sidewinder content? We need help with lots of stuff. So even if you have a spare half an hour now and then, that would help us. We have posted a list of our current volunteer positions here. There are numerous ways to get involved with producing content. You could help with such things as music, doing news reports, voice overs, social media updates, blog updates, writing radio dramas and video production. Please contact us if you'd like to help. Can I be a voice on Radio Sidewinder? Maybe! If you're interested in getting your voice on Radio Sidewinder, please free feel to send us a recording. See this web page about doing radio adverts and details on submitting a recording. I have an idea about additional content, who do I contact? Great! We are always looking for new ideas and content. Please contact us. Can I stream Radio Sidewinder on Twitch etc? It's awesome that you want to use us on your streams. Unfortunately though you may get copyright notifications when streaming Radio Sidewinder. For some music tracks we have been given special permission to play them by the artist. Also some tracks we play require a link back as part of the licensing agreement. We have a credits page (https://www.radiosidewinder.com/credits-music/) that provides the required link back, but of course, streamers have no way of knowing what those tracks are, or are able to provide a link back to the artists website for each one. TLDR - No, you can't stream or rebroadcast Radio Sidewinder. 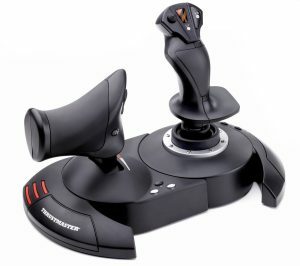 Does Radio Sidewinder have a player group I can join? Yes we have a minor faction in-game, called the Radio Sidewinder Crew. We are based in the Tago system. Note: You cannot be in another wing/minor faction and be in the Radio Sidewinder Crew (RSC) at the same time. Loyalty and dedication are a must! What is the goal of the Radio Sidewinder faction? Members of The Radio Sidewinder Crew minor faction are actively engaged in the promotion of free speech and great tunes... because music unites the Universe and information is power! It's our aim to make Radio Sidewinder the premier information network whilst educating and entertaining Commanders, both new and experienced. One of main goals is to control our region of space, 30 light years around our home system of Tago. How can I assist the Radio Sidewinder Crew? The Radio Sidewinder Crew (RSC) have various different jobs you can do. You could be involved in combat, trading, mining, prospecting or something more administrative like recruitment. We post regular updates in our Discord channel about our current objectives. If you're interested in joining then sign up to the Inara website and then click the Join button on our wing/group - http://inara.cz/wing/568 Once your excepted as a member you will get access to our RSC Discord channels. 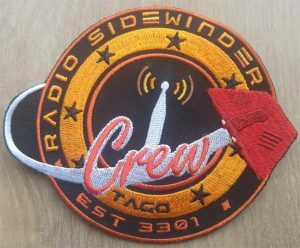 Who and what is the Radio Sidewinder Crew? The Radio Sidewinder Crew (RSC) is the collective name given to members of this minor faction. 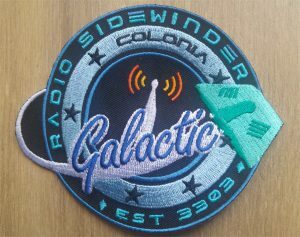 Radio Sidewinder is an independent, media organisation that broadcasts music, news and gossip to Commanders across the Galaxy. The organisation has become so large that it was now started to form a Government and control entire systems. RSC is an independent, democratic minor faction based around the system of Tago. In the early 21st Century media organisations on Sol grew extremely rich and powerful. They controlled many information and news channels and the growing population had an insatiable appetite to get the latest information via their electronic devices. Whilst Radio Sidewinder is not that old, having been formed in 3301, the galaxy still has that same insatiable appetite for information and entertainment. This has enabled the RSC to grow very quickly and establish itself as a minor faction/government. Would you like to know more? 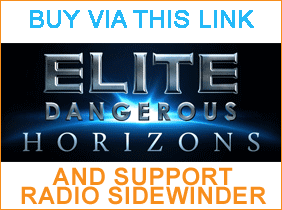 Sign up to the Radio Sidewinder Crew here.